Improve the organization and appearance of your rack in seconds, with a tool-less vented blanking panel. The RKPNLTL2UV 2U Tool-Less Vented Rack Panel mounts to a standard 19" 2 or 4-post rack to improve the organization and appearance of your rack in seconds. This TAA compliant product adheres to the requirements of the US Federal Trade Agreements Act (TAA), allowing government GSA Schedule purchases. The blank rack panel offers a tool-less design to save you time through simple installation or removal, with locking pins that secure into place with a quarter-turn. 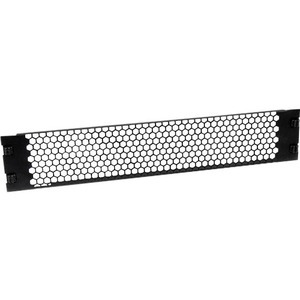 The panel is made of high-quality steel for long-term durability, plus the vented design allows for unobstructed airflow through your rack.